AV42. 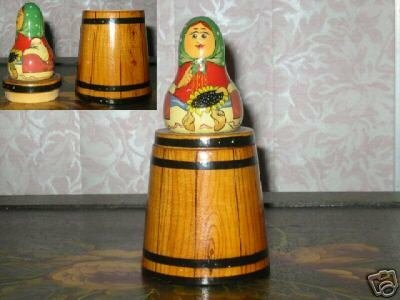 Vintage Russian Nesting Doll on Barrel 4"
Unusual Russian lady container with lady sitting on top of a brown barrel. You can see her feet and toes in front of her. She is also holding what looks like a large flower with yellow petals. Height of the whole piece including the barrel measures around 4". Excellent condition with hardly any paint loss, no marks on the bottom but on the back of the lady there are some letters that look like Russian writing and numbers 96 (don't know if this is a date).